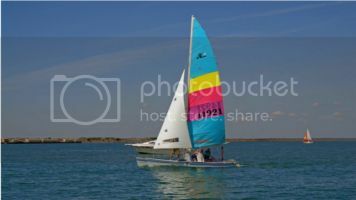 Hobie Forums • View topic - looing at 18/18sx best years and ones to aviod ? Post subject: looing at 18/18sx best years and ones to aviod ? I've been looking at 18ft hobies several people say 84 or 85 newer ? what were the problems or dislikes about the older ones ? did the 1980s or any other years have the delamination problems like the 16's ? any other problems they have to look for ? Post subject: Re: looing at 18/18sx best years and ones to aviod ? Boats built before ‘84/85 were significantly heavier and tend to be more prone to delamination due to manufacturing inconsistencies. The boats in the ‘84-‘86 era (red lines) were lighter but had issues with hull failures. The hulls can crack under the crossbar flanges or in extreme cases, the bow can snap off. All boats from ‘86 and onward also had the upgraded rudder system. Late ‘80’s to early 90’s the structural issues went away but the weight came back to some degree. The manufacturing process was also improved to integrate the daggerboard cassette into the hull layup which eliminated a potential leak point. ‘90’s - 2000’s strong, reasonably light well built boats with all modern features. What srm said, though I'd like to add that although the early H18's were heavier and might've had some manufacturing inconsistencies, they were also (over)built like a tank, so if you find one in good shape they can be pretty solid boats. The trick is finding one that hasn't been neglected. My '79 is very stout, though I have seen some of the delamination that srm mentioned. But if you catch it before it gets too widespread, I don't see any reason that you can't keep the boat sailing for a good while. I had 2 soft spots in my hulls after my first year, and I was told the boat probably wouldn't last another 5. It's lasted me 5 years and I would say will last at least another 5. I've gotten 3 more soft spots, but the fix is pretty easy. I even weighed the pot of epoxy before and after my last soft spot repair, and found that it added only 0.5 lbs of weight, and the deck is as stiff as ever! Whatever age boat you get, just be sure to take care of it. Make sure to ventilate the hulls and keep them dry inside. Store with hull ports off to avoid condensation in the hulls. Keep the boat buffed and waxed, and covered when not in use. Store sails somewhere dry and out of the sun. Store the hulls indoors in the winter. Repair soft spots, delamination and deck edge separation as soon as they occur, to prevent them from spreading. All of this will ensure the boat lasts as long as possible, and prevent soft spots. Thanks for replies, I have very early H14 familiar with delamination, It was the first hobie I sailed on years ago, looking to put it up and replace it just can't decide on 18sx or H16, back in the early 80's always wanted 18sx, But the small lake I sail on thinking H16 might be better choice ? I don’t think the size of the lake matters much. The 18 goes maybe a few mph faster than the 16 at best, hardly a big difference when it comes to the room you need to sail it. The 18 is just a smoother and more forgiving ride, but also has more adjustability now the rig and can be tuned to go faster. It also handles waves and more crew weight much better. An SX rig will be tough to find. There are some out there, but they’re a bit more on the rare side. Similar to (but not quite as rare as) the Hobie 20 and 21 variants. The SX has a longer mast, taller sails, longer shrouds/forestay, and the SX wings, which were also sold as an add on. SX wings are the easiest to come by, as many people bought them as extras. The mast will probably be the hardest. The sails will all have to be custom, as the originals were mylar and are certainly all ruined by now. The shrouds and forestay are still available or easy to make otherwise. There are a few people on here that have SX rigs and love them though, John Linn being the one that immediately comes to mind. He also has a custom spinnaker setup on his. I don’t think you’ll get him to part with it though! in812 where do you live? All H18 can have soft spots, you have to evaluate each boat for condition. Shown below my former 1991 Hobie 18SX with Tiger Main (easy conversion just changed the head plate). The extra SX mast length is needed to fit the tiger sail. 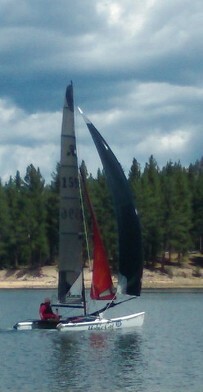 Aftermarket SLO jib, Hobie Tiger Spin setup with 21spi. Black is slimming!!! Great boat, it now lives in Santa Cruz, Ca. I have a SX mast available if you want to build a similar boat and a white Tiger main sail. Post subject: Re: looking at 18/18sx best years and ones to avoid ? Thank you, yes we love our SX18 with Tiger spin, although this last weekend I sailed a F18 of another brand - wow, those F18's can fly. We broad-reached under spinnaker for about 1 1/2 miles on one hull. Zoom zoom. To me, the SX is still the ultimate 'do anything' cat. Go to a Regatta, go fast, go slow, go out with family or friends, or just by yourself. The Getaway is a close 2nd, although with less performance. If you choose a Getaway, you can add a H16 Spinnaker. The addition of the Tiger spinnaker has really improved our downwind performance. Contact your Hobie Dealer or speak to Chip at Whirlwind for new sails. I do NOT recommend the square top main.....I have posted on that subject before. Well I now own 1980 18ft ! only thing I see missing is the rollers on the diamond wires what do those do ? are they needed ? You need the rollers so that the jib will move across smoothly and not get torn. May I suggest you look up how to service the rudders......that is a key to smooth sailing. Congrats on your purchase. Where are you located? If your rollers are missing or broken, you can just use rigging tape (or electrical tape in a pinch) to wrap the ends of the spreaders. In fact, it's a good idea to do this regardless of whether the rollers are there or not. I Think * I have all the rigging figured out except the downhaul ? On the port side of the mast on the vertex plate I have a small block on the stbd side a small v cleat but it is put on to tension a rope from the bottom of the masts up not pulling down ? what am I missing ? what's the v cleat for ? main should be held by the ring so the halyard shouldn't need tension ? Sounds like perhaps the V cleat was installed upside down by the factory. The original/stock downhaul on the 18 was very minimal, especially by today’s standards. Downhaul line tied off to the grommet on the sail, fed down through the block on the side of the mast, back up to the grommet, and finally down to the V cleat on the opposite side for a 3:1 purchase. Updating the downhaul to more purchase (at least 5:1), adding some ball bearing blocks, and adding at least one pivoting exit block to replace the V cleat would be highly recommended. These upgrades will really improve the functionality of the downhaul system. I'll drill the rivets out and turn it over for now, any special rivets needed ? been looking at 5:1 setup and someone suggested that also, just want to get the boat out do shake down run before I start ordering parts ! The boat functions without the downhaul... as you mentioned, the ring locks in place, so there's no tension on the halyard. The 3:1 system isn't worth much, and I don't think I used it my first time out. It's there to help control sail shape, but it's a little more of a "fine tuning" control... it's not like sailing without a mainsheet! It is important when you want the boat to perform well, but it's not necessary your first time out unless the wind is up. I would disagree that the downhaul is not important. At the very least, having downhaul on with a little tension provides confirmation that you got the halyard ring properly engaged and it also prevents the halyard ring from popping off the hook while sailing. Going a step further, even the 3:1 downhaul will help pull the wrinkles out of your mainsail and help force draft into the sail. All of this is important, even for a first time sailor. The stock 3:1 downhaul has limited function, but it is still useful. You can get more function out of it by using the mainsheet to assist with pulling the sail down. If it's windy and you want to pull on more downhaul, have the crew tighten the downhaul while you pull in on the mainsheet. Once the downhaul's set, you can release the mainsheet and your sail will be pulled down much farther than would be possible using the downhaul line alone. This is how we worked the downhaul back before the more powerful systems were allowed. Personally, I would skip the V-cleat. They just don't work well (even if they're installed properly). If you don't want to spring for an exit block, then get yourself an aluminum clam cleat for around $15 and rivet it to the side of the mast (use stainless rivets). You can attach it towards the back of the mast (in the area of the sail track, below the gooseneck) so you don't even need to worry about sealing the mast.